Genesis26 I dare say Priest of the Forgotten Gods is the best sacrifice outlet we have in standard right now. It's the go-to turn 2 play BECAUSE it's summoning sick, so it's got to be played as early as possible. Besides, even if it didn't have summoning sickness there's nothing to sac on turn 2. On turn three, we can follow the priest up with another expendable creature body ( Ministrant of Obligation is ideal) and sac it + the turn one play for value. This, however may not even be the ideal play, since we really don't even want to start saccing things in the early game; it's better to wait till the mid-game for more value with Teysa or Visitation. For RNA : Biogenic Ooze Angelic Exaltation Unbreakable Formation Ministrant of Obligation What do you think? Or maybe change a lot and make it about Hero of Precinct One with Heroic Reinforcements Join Shields , etc. 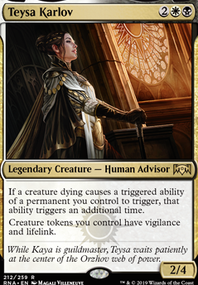 Teysa, Orzhov Scion , Bloodchief Ascension , Grave Pact , Deathbringer Liege , Hanweir Militia Captain Flip, Hallowed Spiritkeeper , Ministrant of Obligation , Tithe Taker , Westvale Abbey Flip. To name a few suggested cards. I have a fairly budget version of Teysa here Teysa, Death Tyrant Inexpensive, and a much more costly version here Teysa, Death Tyrant. Shingouki on Do you even exile, bro? chrclgry I had it sideboarded for Ministrant of Obligation to speed up the deck but I'll switch it over and see how it does as a main player. COLINTFF Hi, no worries about typing alot, I type alot often lol. I like the new formation you've done with it. Looks really good, Plaguecrafter is a good card, especially when you mix afterlife and the opponet having to sacrifice something as well. Three Midnight Reaper probably works alot better and I think your right, its a lot of 3 drops, plus you do have other card draw sources as well so it would synergize well, agreed. 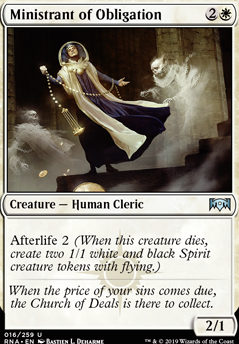 Yeah, keep the Divine Visitation idea for sure, its a really good card for tokens, by using afterlife with it, you can accumulate plenty of angels. Imperious Oligarch is not a bad choice, more two drops can help out alot actually when you go to play Visitation later in-game. 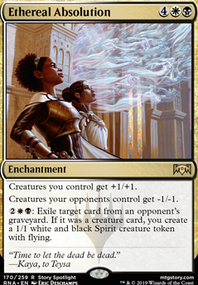 I like Ministrant of Obligation due to its afterlife 2 effect but it is a 2/1 creature like Oligarch plus an extra mana. I understand where your going with it. Keep up the cool deck ideas, I hope it works out for you like you mentioned. Not to many other ideas I could recommend, your on the right track for sure. Especially in finding a way with the Visitation card. Also yeah I agree about that as well, lots and lots of different Afterlife renditions. Finding whats fun for you is what would matter. Never think theirs an "exact" way to make a deck. Whatever works for you and enjoyable to play works better than playing a deck you wouldn't enjoy. Some additions definitely help. Typed alot like I mentioned at the start lol. Let me know how it performs for you when given the chance, and if you have any more ideas or ways to implement the deck idea. Hope it works out :).